1 of 1 Heat oven to 350 degrees . 1 of 2 In a large bowl, beat butter 1 minute; add sugars and beat 3 minutes. Beat in flour on low speed until just incorporated. Beat in pecans. 2 of 2 Press mixture evenly over bottom of a 13 x 9 x 2-inch nonstick baking pan. Bake at 350 degrees for 10 minutes. Cool slightly. 1 of 3 In a large bowl, beat cream cheese and sugar 3 minutes. Add eggs and vanilla and beat 2 minutes; beat in tequila, lime juice and zest. Beat in cornstarch. 2 of 3 Pour topping over crust. Bake at 350 degrees for 20 to 25 minutes, until set. Cool slightly; refrigerate 1 hour. 3 of 3 Cut into 20 squares and refrigerate until serving. 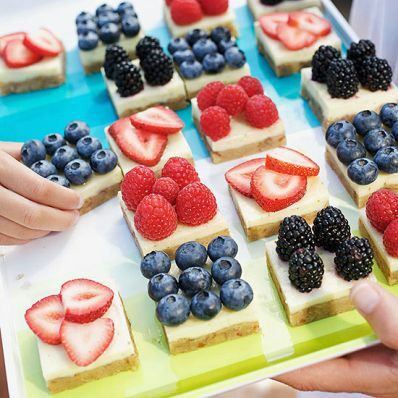 To serve, trim off browned edges and top with berries.